SAVE THE DATES! July 13 and 14, 2019. Come help us celebrate our 27th year and enjoy a wonderful day in Haddonfield.. The Festival draws more than 100,000 attendees and is convenient by car or public transportation to visitors throughout the Delaware Valley. There is a PATCO station within steps of Kings Highway. Time: Sat 11 AM to 7 PM, Sun 12 Noon to 5 PM Rain or Shine. 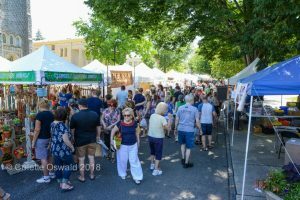 In 1993, Renaissance Craftables, a local family business, along with Haddonfield’s business community, came together to create the Haddonfield Crafts and Fine Art Festival as a way to promote artists and the Downtown. Over the last 25 years, the festival has grown to be one of the best in the country. The festival has increased from 180 artists to 250, growing beyond the main stretch of Kings Highway to include Tanner Street and Kings Court. A curated selection of artisans will exhibit a wide range of arts and crafts, including ceramics, glass, jewelry, wood, fiber, metal, paper, drawings, paintings, photography, and wearable art. What is usually a busy main artery through the center of town is transformed into a festive corridor, alive artists’ tents, outdoor cafés, musicians and more.